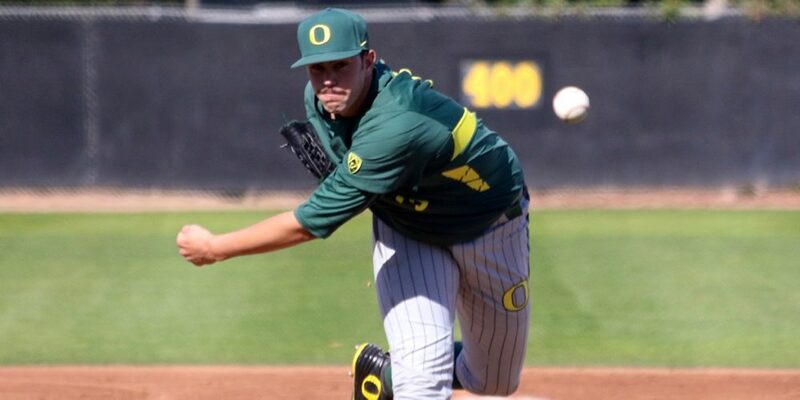 EUGENE, Ore. – From now until draft day, Oregon southpaw ace David Peterson is going to have a lot of eyes on him from the scouting world. He had that attention on him with Team USA last summer, and he hasn’t wilted in front of that scrutiny so far this spring, coming up with monster performances like his 17 strikeout masterpiece against Mississippi State a couple weeks back. The spotlight, nor the conditions, seem to faze him. Take his Friday night performance for example – on top of pitching in temperatures that hovered in the upper 40s, Peterson pitched through a steady rain that fell for a good portion of the night, and there four errors made behind him. Despite all of that, as well as a very game, very tough Washington lineup putting some high caliber at-bats on him, Peterson and the Ducks came away with a victory on Friday night in Eugene. The 6-foot-6 lefty tossed seven innings, allowing just one earned run out of the three Washington put on the board against him. He did not walk a batter, allowed six hits and struck out seven. And he did this without necessarily having his best command from inning to inning. It’s also worth noting that two of his strikeouts resulted in the runner ended up at first base, after sliders got past his catcher Tim Susnara.